Solenoid Valves – Plast-O-Matic Valves, Inc.
Electrically actuated valves for severe service applications for virtually all types of solutions. PTFE bellows barrier seal in both direct acting and pilot operated designs; proven million-cycle life provides lowest cost of lifetime ownership. Normally-open and three-way models available. ¼” through 3″ sizes. Series EASY-NO for pressure, drain, and vacuum service; designed for applications requiring a valve to remain open when de-energized, or when it would be dangerous for a valve to close during a power failure. Includes W24 fully rectified coil with Z-Cool DIN. Rectified R24 coil optional. 1/4″ or 1/2″ sizes. 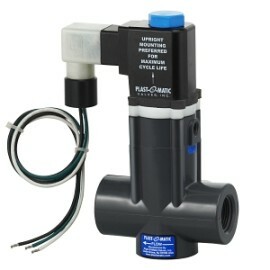 Series THP for pressure or drain service; designed for applications requiring a diverter or “sampling” valve. THP is ideal for sprayhead or filter applications where high backpressures exist. Includes W24 fully rectified coil with Z-Cool DIN. Rectified R24 coil optional. 1/4″ or 1/2″ sizes.